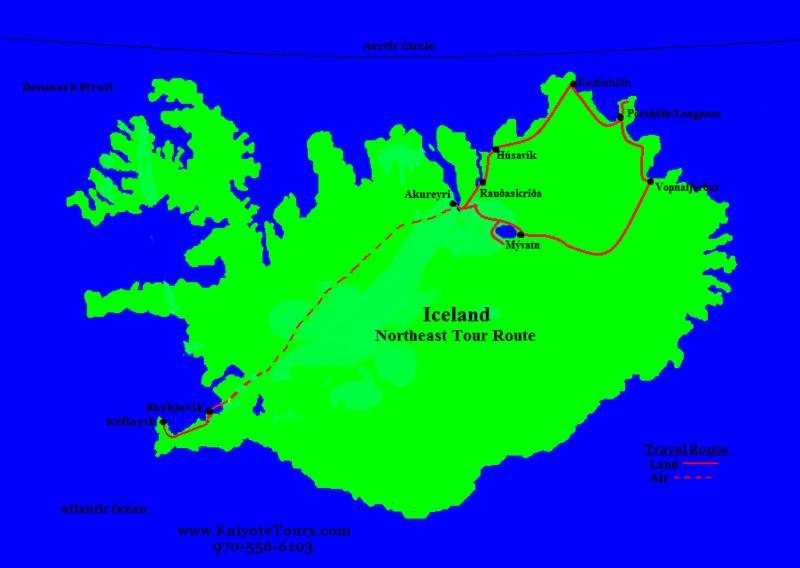 If you are interested in Birding Northeast Iceland Tour, come and join us at Kaiyote Tours! On this trip we will spend most of our time along the northeastern coastline walking and looking for birds. This trips mostly focuses on birding. We start out this 10-day trip in Reykjavik. Reykjavik is a great city for art and culture. We will fly from Reykjavik to Akureyri. The next five days we will be visiting the best birding and nature sites in the Northeast part of Iceland. This area has a stunning ocean shore line, beautiful lakes and mountains, great walking trails and a lot of birds to see. We will spend our last night back in Reykjavik. In the morning, we will be taking a 45-minute flight from the domestic airport in Reykjavik to the city of Akureyri. It is about a 1-hour drive to a small fishing village called Húsavík. Along the way we will visit the Goðafoss waterfall and a few birding spots. We will be staying in a rural area, just outside of town, in small cabins. This area is great birding, hiking and fishing. Húsavík is a great town for whale watching, birding, hiking and museums, so there will be lots of choices for activities here. If you like birds and boats, we will be taking 2-boat tour to a puffin breeding colony. From Húsavík we will be driving along the northeast coast for walking, viewing birds and experiencing the amazing coast that is only 25 miles from the Arctic Circle. We will be staying near a town called Þórshöfn at the Ytra Lón Farm. The second largest breeding colony of Northern Gannets in Iceland is close to this farm. It is a 3-hour drive to Lake Mývatn. There will be birds, waterfalls and geological sites to see along the way. We will visit one of Europe’s most powerful waterfall called Dettifoss and the Námafjall geothermal area to view steam vents and boiling mud pools. We will arrive at Lake Mývatn and stay for 2-nights. We will have all day to explore Lake Mývatn. It is a 60-mile loop around the lake and plenty of birds to see and wonderful short hikes. There will be time to visit the Mývatn Nature Baths. It is a 70-mile drive back to Akureyri and we will be taking a mid-morning, 45-minute flight from Akureyri back to Reykjavik. From there we will drive out to the Reykjanes Peninsula for our last night. This area is great for birds and geological sites. Flights back to the States usually leave in the late afternoon. On our way to the airport, we will stop and visit the wonderful and amazing thermal pool called the Blue Lagoon for a swim and a soak.